Quality: The smooth type varieties freeze as well as or better than the ridged varieties because they do not split as easily. 1. Select young tender pods and separate into small pods (4 inches or under) and large pods. 2. Wash. Remove the stems at the end of the seed cells, being careful not to expose the seed cell. 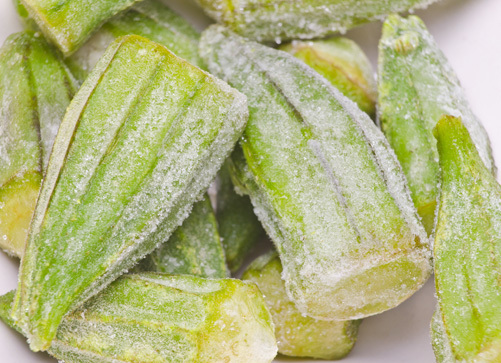 For Frying – Wash and remove stems. Blanch small pods 3 minutes and large pods 4 minutes. Cool promptly and drain. Slice crosswise and dredge with meal or flour. Spread in a single layer on shallow trays. Place in freezer just long enough to freeze firm. Package quickly, leaving 1/2-inch headspace. Seal and freeze. Water blanching: Water blanch small pods 3 minutes and large pods 4 minutes. Cool promptly and drain. Leave whole or slice crosswise. Package, leaving 1/2-inch headspace. Seal and freeze.